Enjoy ultimate styling and precision with the Philips 12-in-1 grooming kit so you can stay in complete control of your style. Groom your beard, hair and body with this waterproof all-in-one trimmer. 12 attachments give you the freedom to create different styles from head to toe, in or out of the shower. Enjoy maximum precision with dualcut blades and added control with a no-slip rubber grip. Use the full size metal trimmer without a comb to get clean, sharp lines around your beard, neck and hairline, or to trim your body hair to a minimum length. The high-quality combs are designed to be durable, reliable and long-lasting. They incorporate our hair-lifting technology, capturing more hairs in every pass. 16mm. 1hour charge time for 120 minutes usage. 5minute quick-charge time. 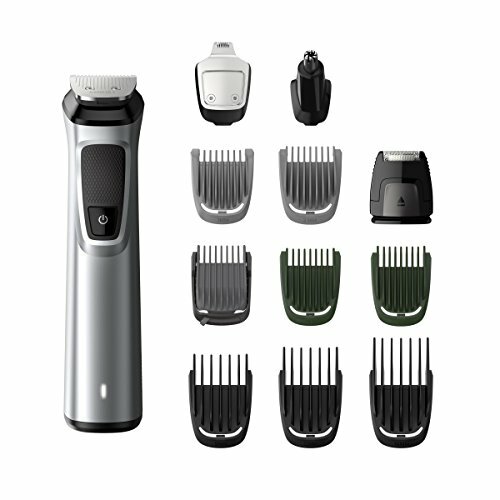 12 attachments: includes full-size metal trimmer, detail metal trimmer, precision shaver, nose and ear trimmer, 3 beard and stubble combs (1-7mm), 2 body combs (3-5mm) and 3 hair combs (9-16mm). 1 hour charge for 120 mins use. Stainless steel. For wet and dry use. Cordless use. Accessories include: travel pouch, cleaning brush, 2 pin adaptor, . General information: Rechargeable battery powered. Worldwide voltage. Rechargeable included. Manufacturer's 5 year guarantee.